Brand names are getting more creative nowadays, and sometimes – expensive products with such exquisite names could only appear in high-end shopping malls – such as The Pavilion. So at The Pavilion recently, I stumbled upon a peculiar brand. Well, ladies and gentlemen, let me introduce to you… the Ciao Ciao brand! 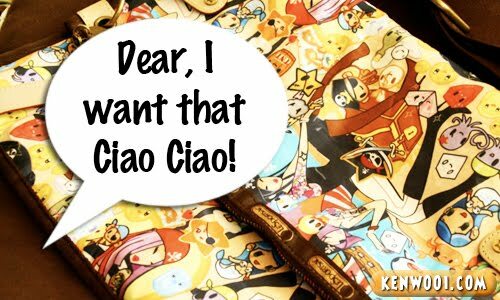 In case you don’t know, “ciao ciao” is a famous Cantonese term for a man’s weenie (aka private part). For example, my ciao ciao is small. Oh wait, like I said – it’s an example, doesn’t mean it’s true ok? Stop imagining! 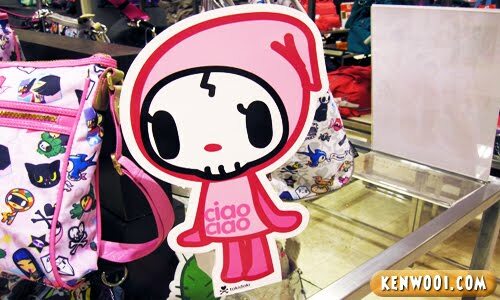 Anyway, if I’m not mistaken, Ciao Ciao is a brand of some bags – particularly for the ladies, if I’m not mistaken as well. Oh wait, what to expect next? Pepet? Tetek? You Think You Are Famous? Hm,that suggestion of yours,if it’s the brand name for something,err make sure it guy’s things!! Ho ho ho..
lol// sound like busuk busuk in cantonese..
Not so bad if in French… LOL!!! walao you just told the whole world your ciao ciao is small.. hahaha! you made me thought of Kukumalu == it’s somehow another sensitive name if you read it as kuku, followed by malu in cantonese! LOL. i guess the person who created this brand doesnt understand Cantonese! oh my god why the name branding so yeng 1! to make customer more memorable on this brand name? LOL, imagine it had a branch in HongKong…it will be a craze! ROFL!! I tot the doll is kind of famous,a branded one right. It name Ciao Ciao?? Ewww~ Why ah?? Huh? Never heard of this brand LOL!! LoL.. PLEASE do not hire Kenwooi as a marketing strategist.. his idea of branding is so phail!! but then again u see that diaper PetPet? It’s gaining HUGE popularity these days.. why lah??! !